There's already been a handful of updates up to this point on February 13th. We don't talk about it a lot and I suspect that's because there's no thread for it! That was ~17% and ~11% compared to the respective days of the previous week. The rumblings are that there's an update today too. All of the various "Google weather monitors" like SEMRush Sensor and SERPWoo Volatility are showing updates yesterday and today. Is anyone seeing fluctuations? Anyone been able to pinpoint it to specific pages, page intent types, etc.? How's your traffic doing? I'm back down to below the lows from the big drop I experienced before Christmas. Down around 36% from the same period last month. I still have a fairly thin site made up of mostly money articles (even my info articles have affiliate links) so I may not be the best example. Revenue has taken a hit. Oooof. Did you mean to make the title of this thread 2018 and not 2019? Did you guys feel this one? There was a minor update. I saw an overall decrease in traffic, just barely, but an increase in buying-intent traffic. My affiliate link clicks are up significantly. Yesterday with residuals today. I can't say I've noticed anything yet but all the SERP trackers are showing a pretty big update. I just got fugly little shift that knocked my traffic down big time. Saw a 15% increase from 22nd and then 30% drop after the 27th. Interesting thing is, time on site dropped after 27th too, so user intent doesn't seem to be getting better. The site isn't 1 year old yet though, so this could be completely unrelated. There was an update on March 1st. I didn't notice it myself but there's a lot of chatter about it. Anyone see any obvious pattern of traffic movement or rankings? Looks like this was a couple of sub index replacements and a clean up. There's a couple of common guest posting footprints that are down at the aggregate level. Not seeing any real movements, but earnings have been slow to start the month. Very slow. Could be incidental though. I got A LOT of clicks today. I can't say I saw anything significant happen traffic wise on my side. These things usually take a two or three days to fully roll out, so I'm keeping my fingers crossed. 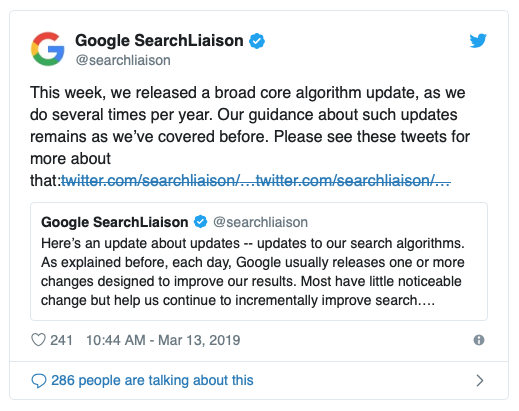 I think it would be a real public service if you made a cohort group from here and very loudly and publicly noted serp visibility changes for the group when ever an update dropped. There's probably also some correlations to mine. I had a few movements up in the top 3 for keyword that had been stuck for months. Not much at the lower end. I have seen big movements upwards. One site which I have been working on for over a year has finally seen some positive movement and is closer to where I think it should be sitting. There also seems to be an overwhelming number of people reporting positive movements... so who lost?? For a other medical page I have checked arround 100 keywords (longtail included) by hand via webmaster tools. In my opionion this update is a change on EAT in combination with the user search intent. Google was collecting data about the search intent over the last month and now google knows better what the main focus of a website is. For this main keywords some sites see now a improvement. The serps are now more keyword based. The biggest winners are pages with a proove of trust and the right user search intent for a every single keyword. I had a nice jump in traffic and sales through the 5th-9th. 7th I saw a drop in traffic. 8th , went back and was on a slow down trend through yesterday, the 12th. Today's about the same as yesterday. I thought it was my nav bar changes but not sure now. Not sure which is 'the factor' yet. My site went up in rank. Then to non-root links being shown. Today the root URL is ranking again. I'm still a new site and honestly i think i got a preview of what my site will be when the dust settles. Tomorrow, I'll know if there's action. With Instagram and Facebook going down though, both from which I get some traffic that i'm sure will effect 'time on site' and total unique visitors...... Could be a hectic week. Nothing is wrong with my root URL i'm sure .. but i'm still building as my competitor have a lot going on. Im surprised one site in particular is getting front page action consistently now . They have a ton of backlinks though, which is interesting. One of my website which lost a lot of top 3 rankings (to page 1-2)in last Aug Update is back with a bang to top 5. Traffic 100% up compared to average but still 60% down compared to pre-Aug update. I have fixed some authorship issue and did a thorough disavow of spammy links. But,I think it is not related to that stuff but a partial reset of Aug update. My site that was hit by Medic last year seems to have started some sort of recovery - double traffic over the last 2 days. I will wait until next week until I start looking at what has improved and why. I saw a lot of other webmasters stating the same on other forums. Sites who got hit by penguin or medic update are suddenly at 2x-10x organics. Okay, so finally the search console has updated for 13. March. It looks like I'm seeing some positive signs. On 13th I got +30% impressions for my most popular pages, which resulted in only +10% clicks. More digging showed that they resulted from completely unrelated queries. For instance, if the post would be "How to defragment your Windows 10 PC", they'd show for "Grey laptops", and "Laptop PC". Should wait another week or two to see where this goes, but yesterday I again got a new record, which was +25% in organics since the update. I saw a massive jump on the 13th (from one #1 position to nine #1 positions) for one of my sites. Since then, it has trailed back to seven #1 positions. I saw a large drop in the #2-#5 positions, but a huge gain in the #6-#20 grouping. The boost in revenue has been quite nice, but I'm not banking on that staying. My gains have been reversed. I am more or less even for one site.